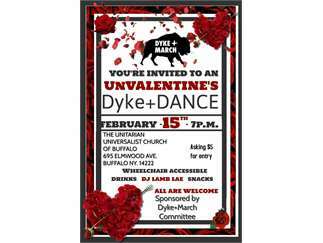 From the 1970s to the 1990s, dances at the UU Church of Buffalo were a staple of local lesbian culture. Join the Buffalo Dyke+ March planning committee as they revive and reimagine this tradition for a new generation of LGBTQ Buffalonians. Music by DJ Lamb Lae. Snacks provided; drinks available. Proceeds to go the planning of the Buffalo Dyke+ March during Pride Week. Cost: Sliding scale; suggested donation of $5.